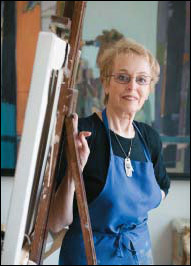 At 73, artist Liz Gribin is introducing her quiet, contemplative paintings to a surprising new audience – shoppers in Banana Republic stores around the world. All it took was one yard sale. LIZ GRIBIN KNOWS A THING OR TWO ABOUT serendipity. In 1939, her family happened to be on vacation in Switzerland when the Nazis invaded Poland, allowing them to flee safely to the United States. 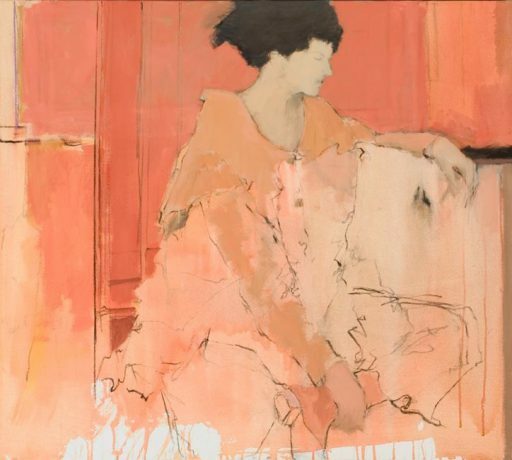 In the 1950s, she happened to be studying fine arts at Boston University just as noted figurative expressionist David Aronson began teaching his inspirational painting courses. And last year, she held a yard sale on Long Island, which proved to be the perfect steppingstone for showing her artwork at Banana Republic stores around the world. How’s that again? “We were moving from Bridgehampton to Boston last February to be near our children and had to get rid of a lifetime of collected stuff ,” explains the 73-year-old painter, whose works have sold for as much as $45,000. The “stuff ” included a number of Gribin’s small paintings and drawings. Nat, her husband of 51 years, put an ad for the sale in the tony town’s newspaper. It caught the eye of local lawyer Errol Margolin, who stopped by and bought a slew of Gribin’s art. He then mentioned the works to a client – who just happened to be assembling an in-store art program for Banana Republic set to begin this month. In addition to the many fortuitous events in her life, Gribin has also suffered her share of tragedy, including the sudden death of her mother on holiday when Gribin was in her 20s as well as the horseback riding accident that left her youngest son in a monthlong coma, followed by years of rehabilitation.